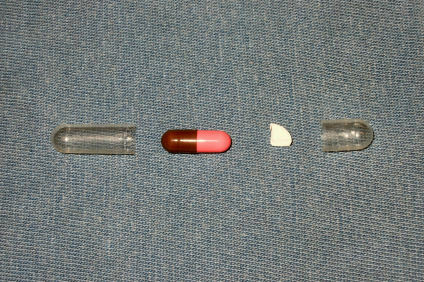 Administering a bitter pill to a sick pet, often a very difficult task even for the experienced Doctor of Veterinary Medicine (DVM). Many pet medications are so bitter that Pharmacists cannot reformulate them into a more palatable liquid, no matter what flavoring they add. Medication like these can naturally cause a cat (or dog) to salivate heavily. Not just a watery mouth but that foamy, shoe string type of salivation. Unpleasant enough for the one administering the medication. Imagine how unpleasant for the patient! Well, there is an easier way to give these bitter medications with little or no taste at all. In fact, this method may allow you to combine two or more compatible pet medications in small doses. Gel caps provide a convenient means of masking the unpleasant taste of those bitter pills. Following this tutorial should help you to speed your sick pet toward recovery. 1. Use clean/DRY fingers to twist and open a size 0 Gelatin Capsule. Lay the halves down onto a dry surface where you can keep track of them and keep them from rolling away. 2. Prepare the objectionable medication by cutting it into the proper dosage and fitting it into the capsule, if it is small enough. Mortar & Pestles provide one means of crushing medications in tablet form, although the back of a spoon will also work. Fold a piece of paper and use it to "funnel" the crushed medication into the longer half of the capsule. Insert the longer half into the shorter half and compress it as small as it will go, without damaging the smooth-rounded ends of the capsule. With a clean dry napkin, wipe away any residue from the capsule as well as your fingers. This will keep the bitter taste from transferring to the outside of the gel cap and defeating the purpose. 3. Forcing the gel cap down the cats' throat using a finger being an option, safer methods do exist. Instead of risking injury to a finger or that little mouth filled with razor sharp teeth, ask your Veterinarian about pet pillers. A 'pet piller,' a handy device about the diameter if an ink pen which incorporates a mechanical plunger and a soft split-rubber tip. 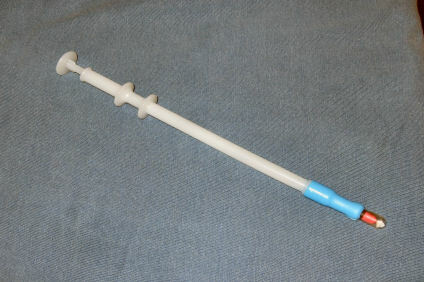 This tool works similar to a syringe in that it allows you to 'inject' the medication down the back of the throat. 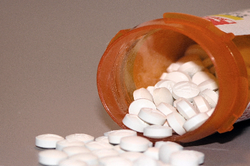 When done properly, the animal will swallow the medication quickly without spitting it back out. Like most new things, this takes practice to perfect. 4. Draw back the plunger and insert the capsule into the split-rubber tip of the pill popper. Lay the pet piller down and prepare the patient. Immobilize the legs by wrapping the cat tightly in a bath towel. While trying to make it comfortable, you need to keep it from struggling and protect yourself from sharp claws. If you do this by yourself, lay the wrapped kitty lengthwise between your legs or across your lap, and hold it in place with your forearm. 5. Gently grasp and immobilize the cat's head from behind, with one hand, your thumb and middle finger on either side of the mouth. Be careful not to hold the mouth shut. With your free hand, hold the pet piller with your thumb or forefinger on the plunger. Be prepared as the cat will naturally struggle! Gently but firmly apply pressure to both back corners of the mouth, working the jaw open. When the mouth opens, quickly insert the popper & capsule [just to the back of the throat] and squeeze the plunger. The capsule will then pop out of the applicator and down the throat. Hold the cats mouth shut for a few seconds, gently massaging the throat while blowing in its face. It should close it's eyes and swallow the capsule without biting into it. If it bites the capsule and releases the bitterness of the medication, it may work it back up and out with its' tongue. It may also vomit the medication out. If this happens, allow your pet to recover from the experience before attempting it again. Negativity will only reinforce fear and encourage your pet to struggle and loathe the entire process. * Talk to your cat in a soothing manner, to reduce anxiety during this process. * If you get bitten, do your best not to react to it. Negative action on your part will only increase the cats' fear and discomfort making it more difficult next time. * Rather than giving the cat a near empty gel cap, fill it with crushed cat vitamins, supplements or wet food. Near-empty capsules are harder to swallow. * Try loading wet food outside of the gel cap, to provide a familiar taste & incentive to swallow. * Administering the medication just after the cat has eaten makes it easier to swallow, since the mouth is wet and the throat is more relaxed. * If the first attempt fails, you will likely have to reload the med into a fresh capsule, since the gel quickly dissolves when wet. A wet/slippery capsule will not stay in the applicator! * Finish all medications in the proper dosages and time allotted, unless directed otherwise by the DVM. * Do not administer medications on an empty stomach, unless specified by your Veterinarian.